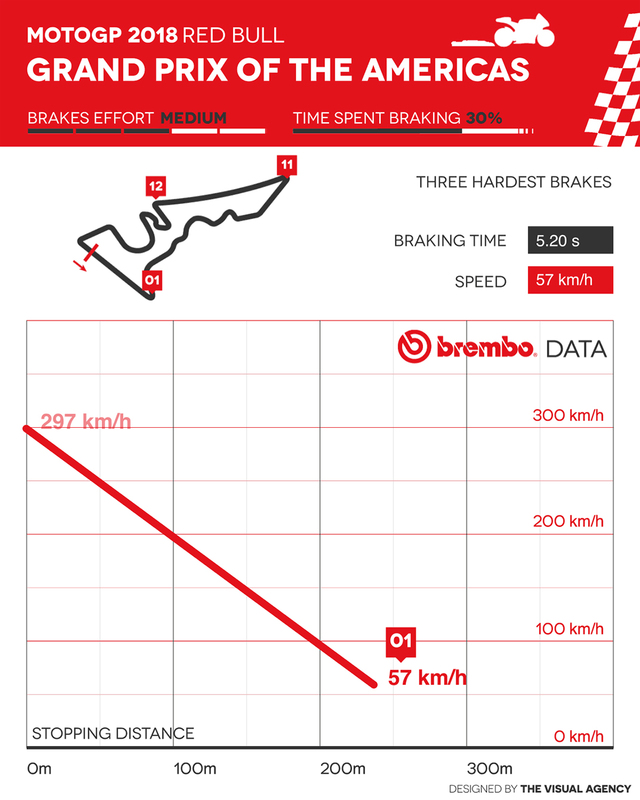 Austin is known for being hard on MotoGP rider’s brakes and the Brembo MotoGP Brake Facts illustrate the three major braking points for the Texan circuit. 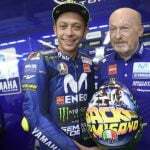 DETROIT, (April 19, 2018) – MotoGP is moving onto North America for the third race of the 2018 World Championship at the Circuit of the Americas in Austin, Texas, April 20-22. The track was designed by German architect Hermann Tilke and is one of the few circuits in the world to host both the MotoGP World Championship and Formula 1. The single-seaters register a lap time half a second lower than that of the motorcycles. Some stretches on the track were inspired by famous corners on historic circuits. The Texas circuit stands out for the intimidating incline on the straightaway leading to the first left-hand turn. 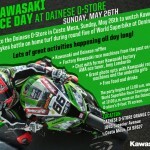 In all, there is a difference of 133-feet between the lowest and highest points on the track, which makes it easy to imagine what might happen if the riders make a mistake in braking on the downhill stretch. The Austin track poses a mid-level challenge on the braking systems. 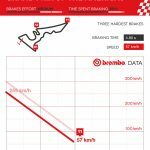 According to Brembo technicians, who assist all of the MotoGP riders, the Circuit of the Americas earned three points on a scale of 1 to 5. 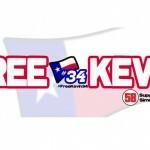 This is exactly what the tracks at Losail and Termas de Rio Hondo registered, but at Jerez, where the race will be held in two weeks, the score goes up to four. 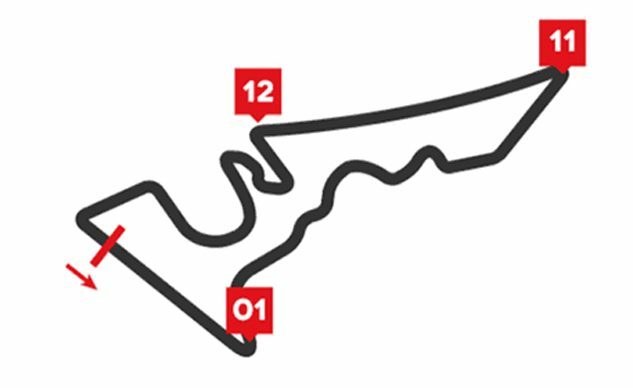 Even though it isn’t the longest track in the World Championship, the Circuit of the Americas has the most braking sections per lap: 13. Only the GP Qatar matches this number. 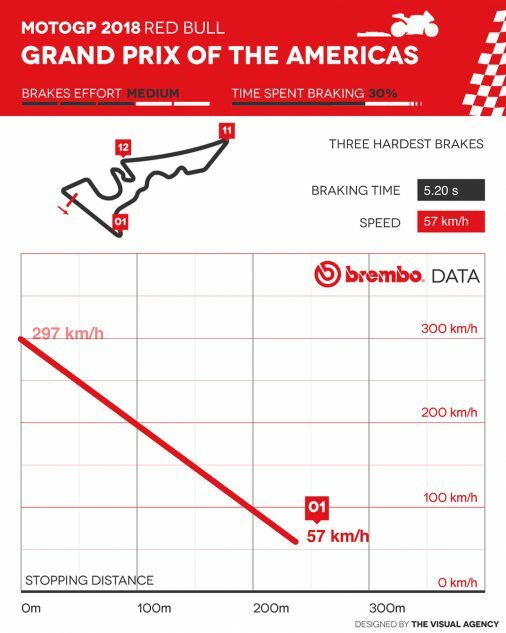 While at Losail the riders used their brakes for 37 seconds per lap, in Austin they brake for 38 seconds, twice the time spent braking at Sachsenring. There are five corners where the riders change direction and brake just what it takes to shave off 18.6 mph, which reduces the average peak deceleration per lap. The deceleration on these curves varies between 0.4G and 0.6G, which explains the average peak of 0.92G, the lowest value in the World Championship. 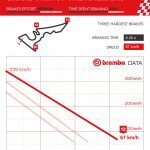 Summing up all of the force applied by a rider on the Brembo brake lever from the starting line to the checkered flag, the result comes in at more than 2,425 lbs. Practically speaking, that means a rider has to apply about 110 lbs. of force every two minute, which is more than a Superbike rider applies. This is why MotoGP riders can use carbon discs, which are thicker than the steel discs used in Superbike. Of the eight braking sections at the Circuit of the Americas, three are classified as demanding on the brakes, two are of medium difficulty, and the remaining three pose only a light challenge on the braking systems. Turn 12 is the toughest of them all: the bikes enter the corner going over 210 mph and they brake for 6.3 seconds to go down to 41 mph. The 1,056 feet of braking is the World Championship record and leads to an average deceleration of 1.5G. At the first corner after the finish line however, the load on the Brembo master cylinder lever is higher (14.7 lbs. vs 14.5 lbs. at Turn 12) as is the pressure on the Brembo HTC 64T brake fluid,whichreaches 11.6 bar, almost six times the pressure of a can of 7UP. 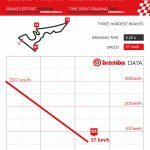 Yet the bikes are going slower when they start to brake, 184 mph, and they push continuously on the aluminum Brembo calipers for 5.2 seconds. Turn 11 also requires a load of 14.5 lbs. on the lever, but the braking distance is 656 feet shorter and the deceleration is 1.4G. This value is still higher than the 0.18G in deceleration a Porsche 911 GT3 RS 4.0 experiences when going from 62 to 0 mph. 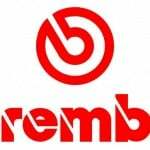 In the MotoGP of the Americas, the Brembo brakes have monopolized the podium in all five of the races contested. 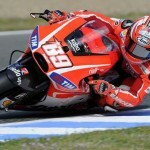 Marc Marquez was the winner every time with Honda, which also won second place twice and third once with Dani Pedrosa. Yamaha placed second two time and third twice.